At the March Marshall County Development for the Future round table discussion, Jeff Rae made a presentation and included a few charts, one of which I have included to the right. (Click on it to blow it up to a readable size.) 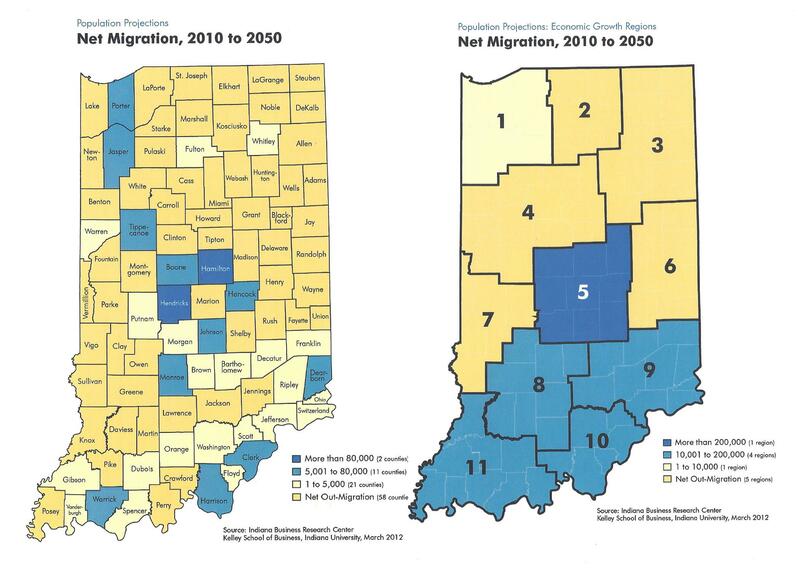 It basically shows the entire State of Indiana showing the projected Net Migration by region and by county. By either metric, Marshall County has net out-migration. MCEDC and other groups are working to reverse this. Culver specifically is working to reverse this via their newly formed Affordable Housing Task Force. This is not a problem that will go away on its own. Progressive action will be required. Can Culver Think Outside the Box? I was pretty disappointed in the Culver Town Council at their last meeting where they addressed the wind turbine ordinance presented to them by the Plan Commission. It will probably cost Culver any opportunity to expand their Extended Territorial Zoning Boundary, but as so often happens, the voice of the few has outweighed the apathy of the many. So be it. But that’s not what this post is about. This post is about Water Towers! DST – Not just annoying, but Deadly??? 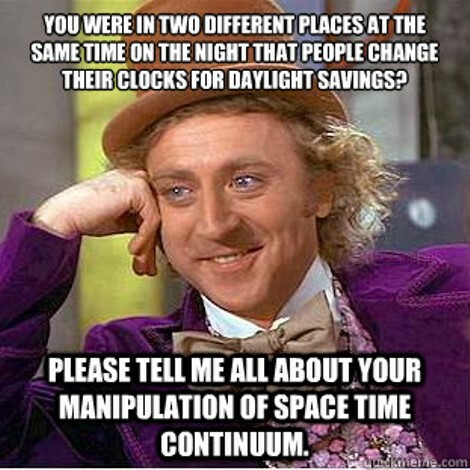 I haven’t always hated Daylight Saving Time (DST). As a kid, Daylight Savings Time was kind of cool… Indiana didn’t participate in the nonsense, but since the network TV shows came from the east coast, when DST rolled around, those shows were on earlier. Shows that were past my bedtime in the winter were on the schedule for the summer. Cool! Then I moved to Georgia after college. Since I moved there in the Fall, my first taste of DST as a participant was “fall back”. This was cool! An extra hour of sleep! But then in the following Spring I experienced DST’s dark side… “spring forward”. What fresh Hell is this? It was just starting to get light in the morning and now we are plunged back into darkness!?! My Monday morning commute, which was never fun anyway, was now an hour earlier and populated by thousands of other grumpy commuters dealing with lost sleep. For the next six years, I spent weeks in the Spring being grumpy and chastising Georgians on this affront to my constitution while expounding on the brilliance of Hoosiers for opting out of the silliness. When I moved back to Indiana I took some glee in poking fun at my friends in the South as they went through the fruitless exercise of DST… That was until 2006 when Governor Mitch Daniels pushed through legislation that forced Indiana to join the insanity. Trust me… nothing cheered up my Georgia friends more during spring forward than laughing at me as I once again joined them in the insane practice. But now this year, the University of Michigan has come out with a study saying that DST is not just an inconvenience that makes me feel like crap, but it could actually kill me! Heart attack occurrences increase by 25% on the first work day after the Spring time change. That will make my morning commute less stressful! Geez! I don’t expect this revelation to change anything. DST supporters have a form on insanity I can’t understand, but I do know that they will not be influenced by logic, facts or rational arguments. I’ll just take an aspirin tomorrow morning before heading to work.